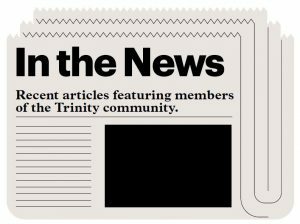 A perennial favourite of our readers, here’s the latest on your Trinity peers. 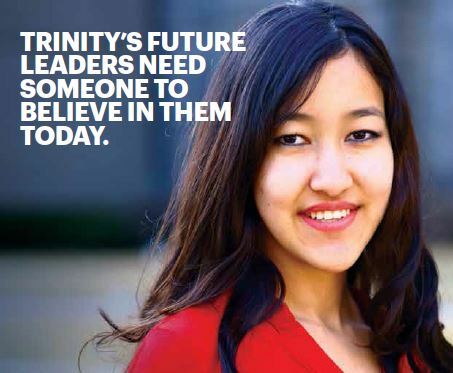 Send your news to magazine@trinity.utoronto.ca. Who else was there: Travis’ aunt Eleanor DeWolf ’66, and her uncles Maurice ’79, Robert ’82, and Thomas ’77 DeWolf. Bridesmaid Alexandra Sundarsingh ’16. 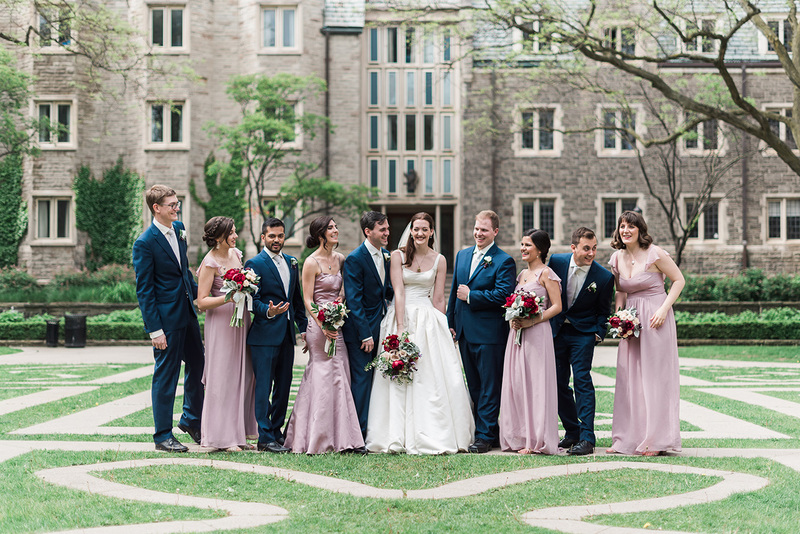 From the bride: “As a Trinity student, I spent a lot of time in the Chapel. Whether it was directing or acting in a show, attending Evensong, or simply needing a quiet place to go on a bad day, something about that space always felt like home. Share your wedding memory Since its official consecration in 1955, hundreds of weddings have taken place in the Trinity College Chapel. Was yours among them? To share your Trinity Chapel moment, send a photo of your wedding day along with a 150-word written account of your experience. Please provide a high-resolution scan of your image (350 dpi or greater, scanned at 100 per cent). Original photos may also be sent for scanning and will be returned. For more detailed submission guidelines, please send an email to magazine@trinity.utoronto.ca. 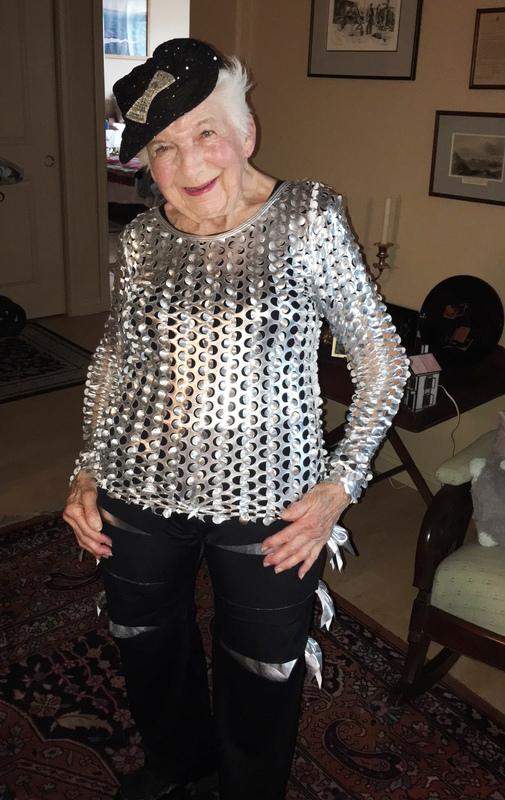 Mary Louise Riley ’48 (pictured left) is an active hip hop dancer and skater in and around Santa Rosa California. She dances eight solo recitals or small concerts a year in California’s Santa Rosa, Petaluma and Sebastopol areas. Rosemary Whealy Clewes ’58 read from her new poetry book, The Woman who Went to the Moon at the Stratford Music Festival in August. The event took place under the Luke Jerram installation called Museum of the Moon, on the Tom Patterson Island. Peter Moogk ‘65 was awarded the Geldert Medal by the Royal Philatelic Society of Canada for his article about transatlantic mail between France and Canada before 1760, published in The Canadian Philatelist (March-April 2017). Alice Major ’71, received the Lieutenant Governor of Alberta 2017 Distinguished Artist Award during a ceremony at the Banff Centre. The award is the province’s most prestigious recognition for accomplishment in the arts. She is also delivering the 2018 Anne Szumigalski Lecture at the Canadian Writers Summit in Toronto. This annual lecture, sponsored by the League of Canadian Poets, has previously been given by poets including Margaret Atwood, George Elliott Clarke and Anne Carson. Francine McKenzie ’89, was appointed Chair of History at Western University in 2016. Michael Szonyi ’89, was appointed Frank Wen-Hsiung Wu Memorial Professor of Chinese History at Harvard University in January 2018. Michael is also the Director of the Fairbanks Institute for Chinese Research at Harvard University. Heather McMaster Ewing ’10 received a masters of public health degree from Vanderbilt University in Nashville, Tennessee. For her thesis, Heather analyzed the knowledge, attitudes, and perceptions of Brazilians with regard to Tuberculosis and stigma. Luke Arnason ‘04 and Andrea Botticelli. July 8 in Toronto. Miranda (Plant) Byers ’08 and Todd Byers: A son, William David Edward Byers, June 8 in New York. A nephew for Tristan Plant ’06, Titania (Plant) ’11 and Jason Woodfine ’12; a grandson for Dorothy (Todd) ’77 and Ted ’79 Byers and for David ’77 and Patti (Brownridge) ’76 Plant; and a great nephew for Doug Brownridge ’78. Arnoldi: Gwendolyn Phyllis Jane (Ball) ’52. Sept. 13 in Toronto. Wife of the late J. Peter T. Arnoldi ’52, mother of G. Frances Main ’84, sister of the late Arthur Winnington-Ball ’50. Bell: Eleanor Mary Sheldon ’45. Aug. 18 in Toronto. Bennett: Grace (Relyea) ’53. Feb. 5 in Parksville, B.C. Burfield: Gary ’60. March 26 in Toronto. Carter: George Ethelbert ’45. June 7 in Toronto. Creighton: Philip William Bruce ’51. Aug. 4 in Bracebridge, Ont. Husband of Phyllis (Manning) Creighton ’51. Dale: Mary Austin (Babcock) ’45. Aug. 26 in Toronto. Wife of the late Robert Dale ’43 and mother of John Dale ’76. Daniel: Ian ’56. May 3 in Toronto. Giffen: J. Peter ’59. June 14 in Kitchener, Ont. Ivory: James Angus ’56. May 14 in Tockenham, Wiltshire, UK. Husband of the late Nancy (Park) ’56. Kostandoff: Louis. March 8 in Barrie, Ont. Father of Carolyn Kostandoff ’81 and of Mark Kostandoff ’83. La Casse: Margaret Helen (Hughes) ’64. Aug. 17 in Gatineau, Que. Lewis, Beverly (Butler) ’55. Aug. 19 in Scottsdale, Arizona. Mother of Janet Lewis ’81, aunt of Kathleen (Flynn) Corrigan ’80 and Kevin Flynn ’82 (Div. ), and sister of the late Barbara (Butler) Flynn ’49. McCallum: Joan (Bowers) ’49. May 7 in Ottawa. McDougall William (Bill) ’50. Aug. 26 in London, UK. McFarlane: Harriet. July 25 in Toronto. Wife of Ivan McFarlane ’65, mother of Michael Szonyi ’89 and mother-in-law of Francine McKenzie ’89. Moes: Joan (Densem) ’53. Aug. 21 in Toronto. Mother of Christopher Moes ‘79. Otto: Stephen ’61. April 22 in Toronto. Scott: Janet Patricia (Davidson) ’69. Feb. 26 in Toronto. Stuart: Peter Bowman ’47. April 12 in Gravenhurst, Ont. Sutherland: Alison Laura Millicent (Armour) ’68. April 10 in Toronto. Mother of the late Malcolm Patrick Sutherland ’08. Thompson: Elaine (Hunt) ’52. April 12 in Parry Sound, Ont. Wife of Frank Thompson ’52. Traynor: Gillian (Greig) ’63. June 11 in Ottawa. Wife of Timothy Traynor ’63. Wilks: M. Isabel ’84 (MDiv). Nov. 25, 2017 in Toronto. Mother of Ian Wilks ’84.